Millennials, Millennials, Millennials. The conversation for at least the last half-dozen years or so has been centered around how to cater to what has become the most prominent group in America, and ultimately the world. 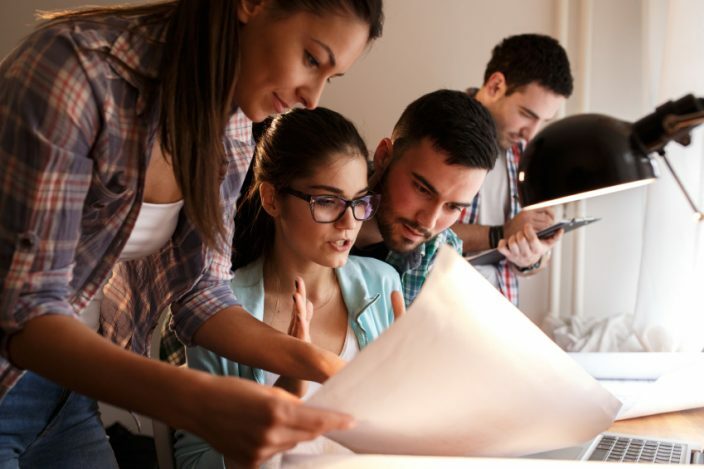 For marketers, Millennials represent opportunity, and for those marketers using direct mail, the opportunity is not only present, but can lead to generating some strong connections to a powerful group of consumers. Before we offer any advice on how to use direct mail marketing to connect with Millennials, you need to remove from your mind the notion that this generation is somehow allergic to anything non-digital. While it’s true that most Millennials can’t go an hour without checking their smartphones, they also encompass a demographic that includes homeowners, parents, business owners, and many other people plenty capable of reading and engaging in a piece of physical mail. The Millennial generation is tech-savvy and highly adaptive to the digital marketing world, but many are still affected by quality direct mail marketing. In fact, about 90% of the generation believes direct mail advertising is more trustworthy than online ads, and 57% have made purchases based on offers they saw through direct mail. To engage Millennial consumers, you’ll need some tips on how to connect to them beyond traditional direct mail techniques. Keep reading to find out what you can do! One trademark of Generation Y is that they have kicked formalities to the curb. No dressing up for work, they write in short form and emojis, and hashtags are a real thing. So your copy needs to be casual. We’re not saying that you have to completely sacrifice brand identity, but you need to communicate in a tone that is consistent to their language. We’ve spoken several times about how multi-platform campaigns are the way to go. When you’re sending out your direct mail pieces, you must find a way to connect it back to some kind of digital promotion or info. This is essential for Millennials who are raised in the digital generation and are comfortable taking action online. Bring your vanity to the forefront when dealing with Millennials, because looks surely matter. The fastest way to get your mailer tossed in the trash is to produce a not-so-good-looking piece. Get your colors down, get your images right, and create material that stands out to the harshest critic. Millennials love feeling like they are a part of something, so why not invite them to do just that? Ask them questions on how you can improve, or on what they would do differently were they in control of your marketing–anything to make them feel special and involved. To engage a Millennial audience, visuals go a long way. With their artistic and creative mentality, you’ll need to include engaging pictures that speak where words cannot. Use contrasting colors to draw their eyes to your message and use the right photos to limit how much text you need to include. Try experimenting with a different size or shape for your fonts, instead of the traditional text used in your mailers or letters. This is a great way to attract your readers’ attention. For many users, online ads get in the way of what they are trying to do online. Your direct mail piece won’t intrude on their life but bring attention to something that adds value to their shopping experience. Send physical coupons, gift cards, or other creative cards to promote your offer and stand out. Your direct mail piece can be used to direct your Millennial audience to your social media account. Or, you can use social media to build anticipation and interest in your print marketing pieces. Integrating your advertising platforms will make you more effective at reaching your audience and standing out from the competition. Online ads are quick and easy to read. There’s lots of white space and clear messages that tell the reader in under three seconds what you are offering them. This principle should be applied to your direct mail piece. It shouldn’t take your reader long to understand what they are being offered, and how they can get in touch with you for more information or to make a purchase. Did you know that over half of Millennials are married with children? The demographic group of Millennials are currently aged 22 to 37, which means they have adult concerns and priorities that you can serve. Don’t make your ad seem unintelligent or belittling to your audience, but learn about what is important to them and find a way to bring value with your product or service. Most Millennials are visual learners, so make sure your direct mail piece includes creative design and color to stand out. Images go a long way to illustrate how your offer will improve or add value to their lives. Your offer should stand out right away to lure them into visiting your web site or physical store to learn more or see what else you offer. As a marketer, you should be tracking every aspect of your new campaign. Make sure you are paying attention and tracking consumer responses to find out if your ad is working as you intended. Invite your consumers to rate their service with you or leave a comment so you can learn more about which products or services they enjoyed most. Once you have feedback, you can make tweaks and adjustments to improve your campaign for the next run. The Millennial generation is very tech-savvy, so adding technology into your direct mail may grab their attention and generate a better response. You can include your social media tags, NFC, augmented reality, and more! As mentioned before, direct mail can work as a gateway to your online content or mobile site or app. Interactive experiences are more enjoyable for Millennials, so find ways to give them that engaging experience. Make sure your direct mail piece connects to online sources where your consumers can learn more, respond, make orders, and share your business with their contacts. Millennials are drawn to check their online accounts multiple times throughout the day, so by combining your online campaign with your direct mail piece, you’ll get double the exposure, if not more. You’ll also make shopping more convenient for Millennials who prefer to shop online and have their orders brought to their door. Mailing lists today are more effective than ever. No longer will you need to send postcards over an entire area to reel in customers! By working with a marketing agency that already has big data-rich lists, you’ll be able to target your consumers better. Millennials are great consumers! When they find a brand they love, they stay faithful for years. Targeting them with direct mail is not as difficult as you may think, and by using the tips above, you will effectively communicate with them and generate sales. Simply ensure your direct mail is inclusive, informative, and not overbearing. Have a clear call-to-action, and make sure your benefits are direct and understandable. Choose vibrant images and colors to distinguish yourself from the rest of the mail they receive, and find ways to connect your digital ad with your online presence. Millennials already think direct mail is more trustworthy, so by adding it to your overall marketing campaign, you’ll be sure to capitalize! Don’t forget that everyone is unique, even Millennials, so find ways to understand what they want and need. Track your progress and use that information to improve your offers in the future. If you want to experience the advantages of a successful direct mail marketing campaign, seek direction from our experts. We can help you set up a successful direct mail marketing campaign, with all the all the information assistance you need to get it up and running. Our services also include print media, direct mail marketing, list brokerage, data solutions, list fulfillment, and list management. For more information about how we can help grow your business, contact us at 1-(845)-230-6300.